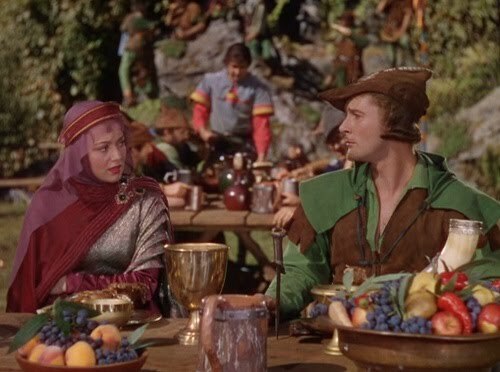 I discovered that movie food was different from real food pretty early in life. I was in love with old movies, especially swashbucklers. I loved watching them and reading about them. The beautiful tables groaning with plate and goblets and gorgeous food made me want to eat like my favorite characters. My poor mother got some peculiar requests for her shopping forays to be sure. I assumed that what we saw was real and delicious. 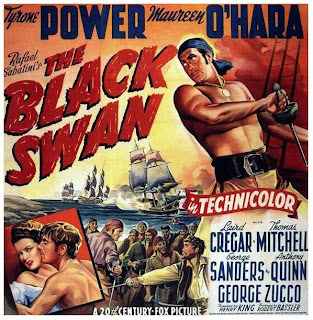 Pouring over old movie star bios as was my wont in those days (I was under 12 after all), I was shocked to discover that Tyrone Power was nearly killed by a chicken. Yes, a chicken. You see, there are 2 different types of food for film, the edible type and food for show. It seems Power took some of the latter and that had been sprayed with DDT to keep the flies away. He decided suddenly to eat the chicken… not a scripted move at all, and before a horrified prop could stop him, he had taken a few bites and was taken quite ill. 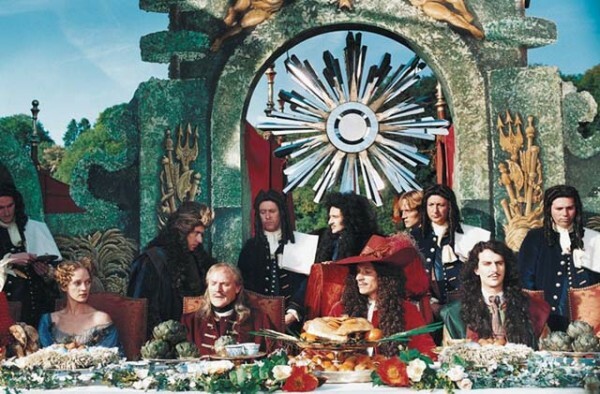 It comes out that much of the food on film set tables… food that has to sit for hours under hot lights or in the sun, is faux food or altered to give it staying power. What is eaten is switched out between takes to keep it fresh and edible. When I grew up and went into the movie business as a member of the art department (the department responsible for food) I learned all of this first hand. I loved hearing set stories from films shot in NY and, as a serious foodie, was especially bowled over by the amazing work that was done by chef Rick Ellis (who also did the food for American Psycho--- quite a stretch!) 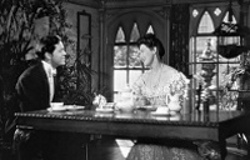 to recreate late 19th century New York society dinners. 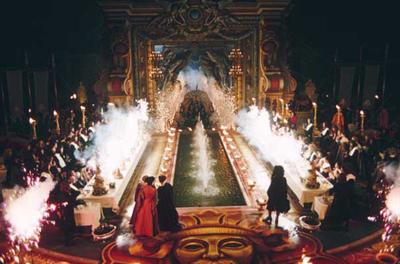 The scenes were further enhanced by a remarkable collection of china and decoration amassed by decorators Robert Franco and Amy Marshall (under the watchful eye of designer Dante Ferretti) on Scorcese’s The Age of Innocence. It blew me away (believe me when I tell you what they did was heroic). There are so many others like the great Babette’s Feast (which I’ve written about HERE) that I've actually cooked dishes from and is a particular favorite. Another food-centric favorite was Vatel (a story of the baroque chef who committed suicide when the fish delivery was late) that featured extraordinary food scenes and decoration. 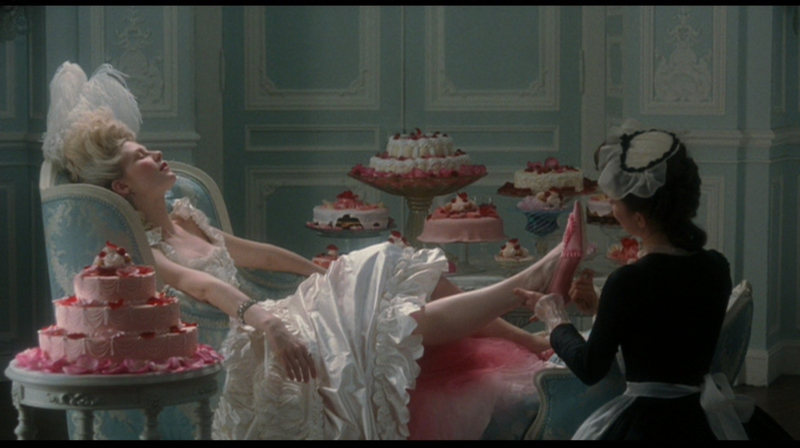 That baroque style was featured once again in Sophie Coppola’s magical Marie Antoinette. But movie food tells a story. 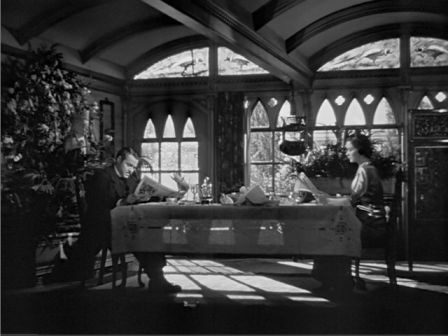 Sometimes the austerity of the table speaks volumes about what is going on in the film. It’s not all about pomp and grandeur. It's about telling a story about lives lived. What and how we eat says a lot about who we are to quote Brillat-Savarin, "Tell me what you eat and I'll tell you who you are." can be enriched by the architecture of the dining room, the design of the food, the decoration and even the lighting. Seduction can come with only perfect lighting and a bunch of grapes... and of course Garbo. As many of you know, I have taken a break from working in films to write this blog. I did a return engagement for a director I love for a film he wrote and directed. 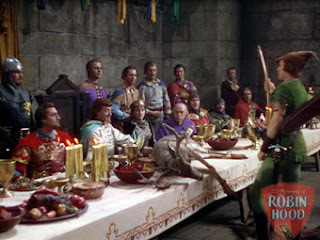 It seemed only right that a major component of the film was a dinner. I forgot what 14-hour days felt like! I cooked and cooked and in the end it was a huge success. All of the food was edible. We had no DDT sprayed chicken! The days of shooting at a dinner table were made easier with oil lights from Firelight Glass –– not having to worry about candle continuity was a real pleasure. The table came from Made of New York and was magnificent. I wanted a table with a lot of character to offset the shine of the dishes. The table is made from wood from old NYC buildings and is a hundred years old or more. The meal was written with duck –– a lot of duck in the described dishes –– so I called D’Artagnan – the best place on the planet for great duck! First, a few weeks before shooting, I went through photos online to show the director so he could pick what he liked visually based on what he had written. We do this for all elements of the film with the director from furniture to paint colors to what’s on a table. We call it show and tell. For that, my input is added to what I have read in the script. For instance, although the script said ‘duck ravioli’, I found a picture of an open ravioli (and a description of the dish from Walter’s Bistro reported by Kevingeats. ) to show him an open-faced ravioli because I told him you wouldn’t see there was duck ragout in a closed up one. From dozens of photos he chose the ones he wanted. I did have to make some changes to the recipes. The food had to last through a whole day of lights and eating since we didn’t have the budget for multiples (actually, in a larger film, I wouldn’t be doing the cooking… outside my job description). The crayfish were on a base of canned cream of celery (the real thing would have separated in an hour) and was based on a picture from choosy beggars that the director had loved. The canned soup stayed exactly the same all day long (it was never intended to be eaten, only seen). The parsley oil did dissipate over the course of many hours and a crayfish being removed to a plate for 4 takes. The foie gras was sautéed and placed on a swirl of apricot jam that stayed beautifully, sadly I didn’t remember to snap the picture till the end of the night!! One picture taken in natural light, fresh on a plate… what a difference! 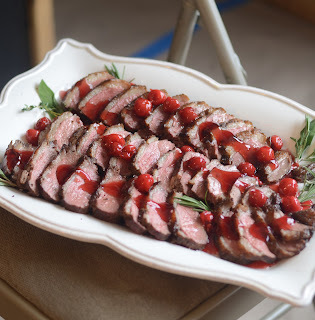 For the duck with cherries, I used plain old cherry pie filling cut with a little pomegranate juice. I brushed the duck on the platter with oil to keep it moist and we added to the actor’s plates with fresh duck. They did eat it all day and I was gratified that the kids on the set, who I was told were picky eaters, said they now loved rare duck breast… to the amazement of their mothers. For the real recipe I would make my old standby, cherries and port… so good! This is after 10 hours of shooting! For the duck ragout pasta, I did make the ragout with duck confit and it was delicious. I bought fresh pasta, boiled it and cut it into squares. I laid down a bit of spinach with my handy giant tweezers and then some duck and Boursin cheese and covered it with more pasta and a drizzle of sauce (I made this from a description that went with the picture I showed the director… and it was delicious). I then slathered it with bottled Alfredo sauce… a necessity because homemade cream sauce would have separated in a minute. Again, the store-bought stuff stood up beautifully and looked the same from beginning to end. The only near disaster came when I left my cooking area and someone used a tea kettle, moving the platter of pasta I had placed there. When they were done, they put the platter back but left the burner on super low instead of off!!!! I caught it before it broke but had to so some repair as the middle had really heated up and the ragout was leaking out of the pasta in an unpleasant way. For dessert I enlisted the aid of Erika Beth at Life’s Too Short to Skip Dessert to make them, since I am not the queen of desserts. Even while running the NYC marathon and prepping for an opera (she is an accomplished opera singer too), she stepped up to the plate and came through with chocolate cake and a lemon tart and cupcakes. We had to make a few changes to make them more like the pictures the director approved (swirls on the cake and caramel on the lemons) –– something that often happens on shoots. It was it great that she made them… the crew ate them up afterward! I made madeleines for an extra plate on the table (4 days later they were stale as could be, but fresh they were perfect). I read about the new Dominic Ansel Bakery on Spring Street in NYC and had to get some of his famous macaroons… they were wonderful and so colorful! I used Daniel Boulud’s recipe for Madeleines courtesy of Donuts to Delirium since I couldn't find the Elizabeth David recipe I usually used and they were just as good as she had promised!! With a sharp knife score the fat of the duck breasts in a criss-cross pattern. Season the duck with salt and pepper. Warm a cast iron skillet over medium heat. Saute the shallots in butter then add the cherries, wines and jelly and spices. Reduce the sauce and pour over the duck. Saute the vegetables in the butter till soft. Add the confit and the rest of the ingredients and cook for 45 minutes over a low heat. What should be left will be thick and rich. Saute vegetables in butter, when soft, add the cream, reduce somewhat then add the cheese and the rest of the spices and parsley. 3 sheets fresh pasta, boiled and sliced into squares. Take enough of the pasta to cover the platter and place on a warmed up, heat proof platter slathered with a layer of sauce. Top each square with some of the spinach and a T of the ragout. Top with another square. Spread the rest of the sauce over it and place in a 300º oven to warm for a few minutes… then serve. Finely grind almonds in processor. Add flour, sugar and salt and process until blended. Add butter and process until mixture resembles coarse meal. With machine running, add ice water, 1 tablespoonful at a time, and blend until moist clumps form, adding more water if dry. Gather dough into ball; flatten into disk. Wrap in plastic; chill at least 1 hour and up to 1 day. Preheat oven to 375°F. Roll out dough on floured surface to 12-inch round. Transfer to 9-inch-diameter tart pan with removable bottom. Fold dough overhang in, pressing to adhere and forming double-thick sides. Pierce dough all over with fork. Freeze 20 minutes. Bake crust until set and light golden, piercing with fork if crust bubbles, about 30 minutes. Cool crust on rack 15 minutes. Maintain oven temperature. Bring a large pot of water to a boil. You want to use a large pot so that your lemon slices aren’t crowded in the pot to ensure that the pieces stay in tact. Carefully add lemon slices, and blanch for approximately 3 minutes. Drain lemon slices, and repeat the process one more time. Bring 3 c. sugar and 3 c. water to a boil, and add blanched lemon slices. Simmer for 25 minutes, and remove to cool/dry on a cooling rack, piece of wax paper, or a silpat. Whisk lemon juice and sugar in medium bowl to blend. Whisk in crème fraîche. Whisk in eggs 1 at a time until well blended. Pour mixture into crust. Remove pan sides, Top with candied lemons. Take the sugar and water and slowly cook to golden caramel. Spoon the caramel over the lemon slices and serve. Thank you for such an interesting and informative post. 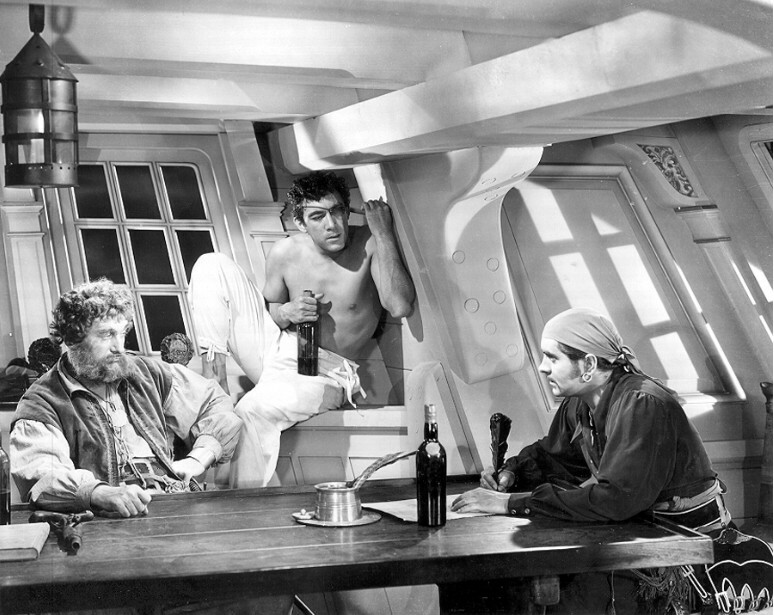 I love the story about Tyrone Power. Thank you for including recipes. You live a very interesting life. This was so interesting! I had no idea how food is set up for films! Fascinating topic on food and film. I learned that in books and in movies, no thing is ever there by accident, everything is calculated and meaningful. I have to say, I was really drawn by the table of the "Age of Innocence" with the fondant fancies, how I love those things! What a fascinating post, Deana. The NY table is brilliant...so much character and you're so right, it sets off the dishes to perfection. I loved reading about how each course was designed, cooked and how you had to alter them to last during the long hours of filming. I've always taken a good look at the food in movies and after reading this, will appreciate the problems even more. Fun to see whose recipes you used and who you turned to for assistance...you are so fortunate to live in NYC where so much is available and we can reap the benefits of your talent. Perfect post for Thanksgiving! And I hope you and yours have a lovely one! The photos as always are delicious..Unique..not to mention the fabulous information always so well researched and shared.. 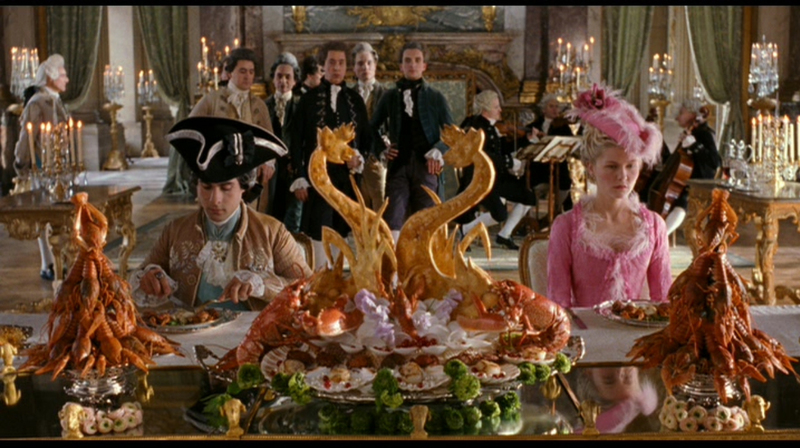 I always hear about the extent of styling treatment for film food and am stunned. It's impressive to see the spread and work that you did for this movie project. Each entree looks so elegant and reached it's purpose - they are just too beautiful to eat. dearest, did you have a wonderful Thanksgiving? I can only imagine that it was delightful! I made a KNOCK 'EM DEAD DELICIOUS PAVOCHON...are you familiar with that? It is a turkey all done up Puerto-Rican style!!! OMG it is so tender. NO KNIFE NEEDED! I marinate the turkey breast in apple cider vinegar and olive oil with lots of garlic and onions and a pesto-type goop of cilantro, cumin, oregano, chili powder and of course, GARLIC! Overnight in the fridge and then cooked slowly in my Creuset pot, this thing is buttery tender! MUCH LOVE TO YOU and thank you for visiting. Etsy selling is quite wonderful!!!! I have a long way to go to produce more items, but it has been a lot of fun!!!! So interesting about Tyrone Power! That would have been such an awful obituary. I am thrilled to see this recipe for duck ravioli. I had a very similar dish at a favorite restaurant not that long ago and would love to try to duplicate it at home. What a beautiful set of food - you are amazing! I guess that'll make an actor think twice before a moment of improvisation! Wow! This post was fascinating! I loved your insights into the way the food on the table enhances the thematic elements of plot and characterization in a movie. I'd never thought about it before, but that's really interesting! I think I've told you this more than once, but I think this was my favorite post yet. It really is so interesting and I'd imagine that food in film is very similar to food photography, which I'm trying to learn more about. Thanks for another stellar post! It looks like you made another amazing feast. 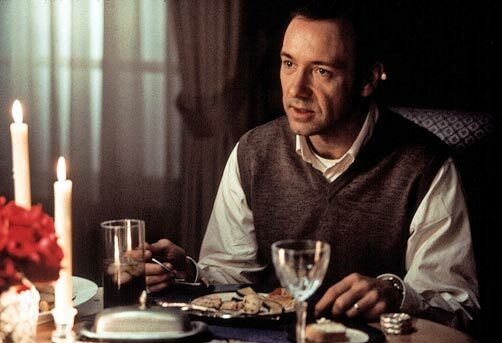 I love your overview of food in film- the Ordinary People shot really does set the mood for the film. 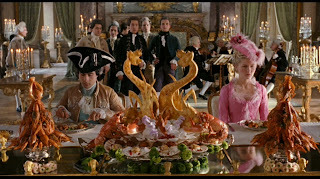 I just wonder how the actors can concentrate on their acting and resist the temptation to eat that food! I just could never have the patience to do what you do ... I respect it so much. I was DA on a commercial shoot once when I lived in NYC and I nearly pulled out my hair. I am so happy there are dedicated, talented and above all patient people like you (though not that many of you to be sure) or else every film would be tossed together in a slapdash fashion.